This backgrounder on Rural Complete Streets was released in August 2016. The Complete Streets approach serves as a framework for ensuring that new roads are built and old roads refurbished to safely and comfortably accommodate all users. As more and more Canadian cities adopt Complete Streets policies, small towns are also exploring how to implement this approach in rural settings. This context brings its own unique set of needs and challenges, but also offers exciting opportunities for improving safety, mobility and health. In summer 2016, Yvonne Verlinden, an intern at The Centre for Active Transportation (TCAT), a project of Clean Air Partnership, conducted a scan of Complete Street best practices in rural Canadian municipalities. The objective was to look at the unique challenges that rural areas face in adopting and implementing Complete Street policies and also to share some of the success stories that have come out of these communities. We would like to thank the municipal staff from the Region of Waterloo, the City of Thunder Bay and the District of Clearwater who provided information and photographs from their Complete Street transformation projects for our case studies. 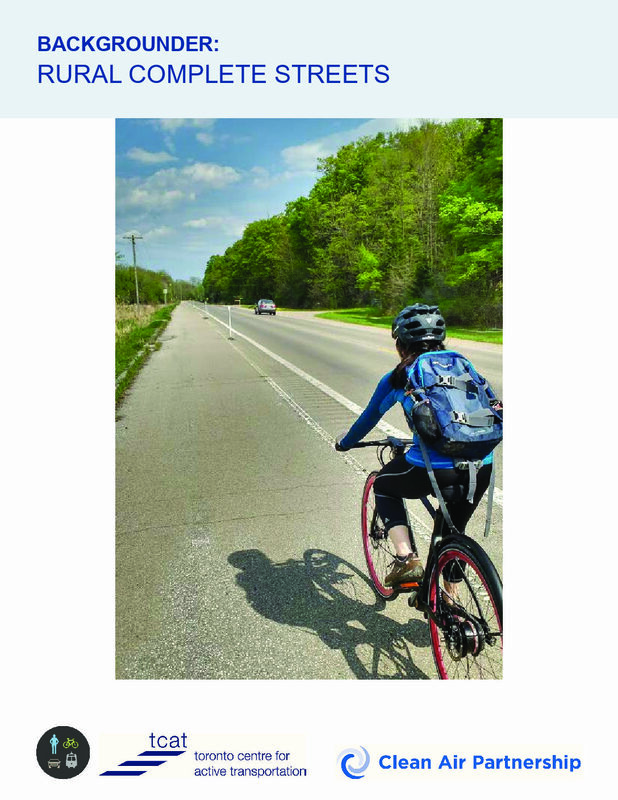 Finally, this report also looks at the need for Complete Streets in rural contexts. With higher road mortality rates and poorer health outcomes than their urban counterparts, rural areas, in particular, can benefit from safer roadways that encourage walking, cycling and other forms of active transportation. Transportation equity is also critical, as those living without a vehicle in rural areas can face serious challenges of mobility in the absence of public transportation and safe walking and cycling routes. On a larger scale, a Complete Streets approach can have economic benefits, by enlivening a rural main street or historic downtown. Our hope is that regional governments and municipalities will find this report helpful, and will begin to see their rural roads in a different light.